Danish designer N.O. Mollers most sought after design is these beautiful dining chairs "model 78" in solid Brazilian rosewood with an amazing grain and the original black Leather upholstery. The chairs are in great original vintage condition. Made in the 1950s at Cabinetmaker J.L. Moller, Denmark. Stamped with makers plate. They are sold as a set of 10 chairs. Few signs of wear to the wood and the leather. 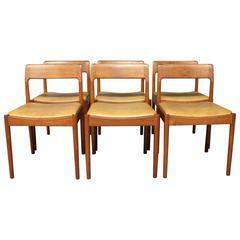 Beautiful set of vintage Mid-Century Modern "Olholm" stools with floating seats in woven cane. An iconic piece of Danish Design from the 1950s. 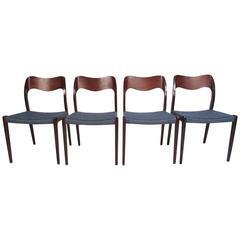 Set of four dining chairs, model 80 in rosewood and cognac colored leather designed by N.O. Møller and manufactured by J. L. Møller furniture factory in the 1960s. 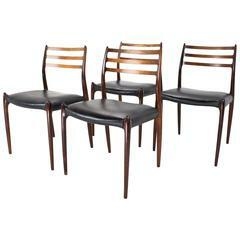 A set of six dining room chairs in teak and light brown leather. The chairs were designed by N.O. Møller and manufactured by J.L. Moeller in the 1960s.